“Rediscover” has been selected to be screened at the Lehigh Valley Dance Exchange SpringUP Dance Festival on Saturday, March 30th. Get tickets & more info here. Jessica was featured in the Reading Eagle – read more!! Thanks, Berks County, for the warm welcome! 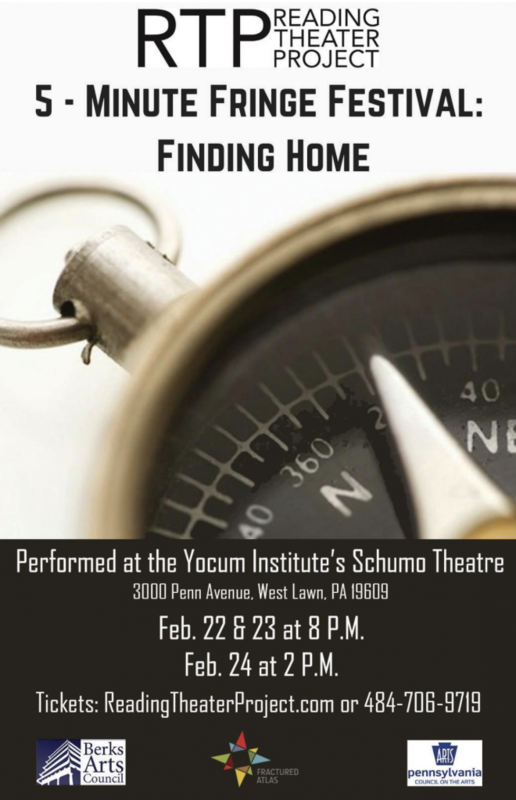 Jessica will be presenting a new solo, “Shred” at the Reading Theater Project’s 5-minute Fringe Fest. Get tickets here. What are some of the adventures you’re looking forward to in 2019? What are you grateful for from 2018? What will you bring with you into the new year and what will you let go? Jessica has been collaborating on a new project with writer and film-maker Jake Buczewski. The dance-film is premiering tonight at KYL/D’s InHale Performance Series in Philadelphia. Check out Fieldnotes for more info. Tickets ($10) are available online and at the door. 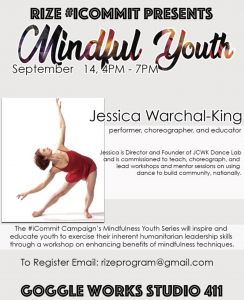 Jessica will be sharing a new solo inspired by Reading, PA at the Dance on the Streets Dance & Music Fest on Saturday. She’ll be performing at 6pm – but there’s a lot happening throughout the day! 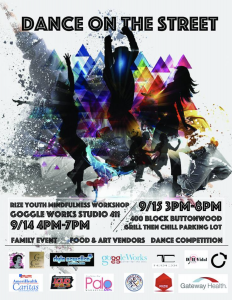 “You are cordially invited to the Dance On The Street Music and Art Fest aka D.O.T.S. Fest. The City of Reading Signature event on September 15, 2018 Reading PA. RIZE and community partners are coming together for our 5th year in celebration of Afro-Latino Heritage Month . Our host for this years event is the Grill then Chill Lounge located at 400 Woodward St, Reading, PA 19601. The #iCommit Campaign’s Mindfulness Youth Series will inspire and educate youth to exercise their inherent humanitarian leadership skills through a workshop on enhancing benefits of mindfulness techniques. Youth from every walk of life can creatively apply its lessons to make an immediate, positive and powerful impact in school, at home, and in their community. At RIZE we encourage youth to express themselves through art, explore their world, engage in their communities, and make smart choices about their future. We also want to give the youth the knowledge and motivation necessary to maintain a healthy lifestyle and to engage their community in doing the same. We had so much fun (and an awesome response) from our Summer Workshops that we’re continuing through Fall. 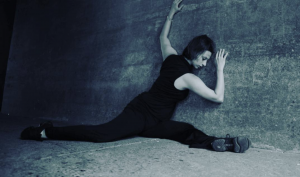 Join Jessica every other Tuesday at The Restorative Center from 6-7pm for Contemporary Dance Movement Practice (for Adults). Cost: $12. Pre-registration is strongly suggested because space is limited. Contemporary Dance Movement Practice (for Adults) explores principles of somatics, energetic awareness, and performance practice with contemporary concert dance foundations and techniques. 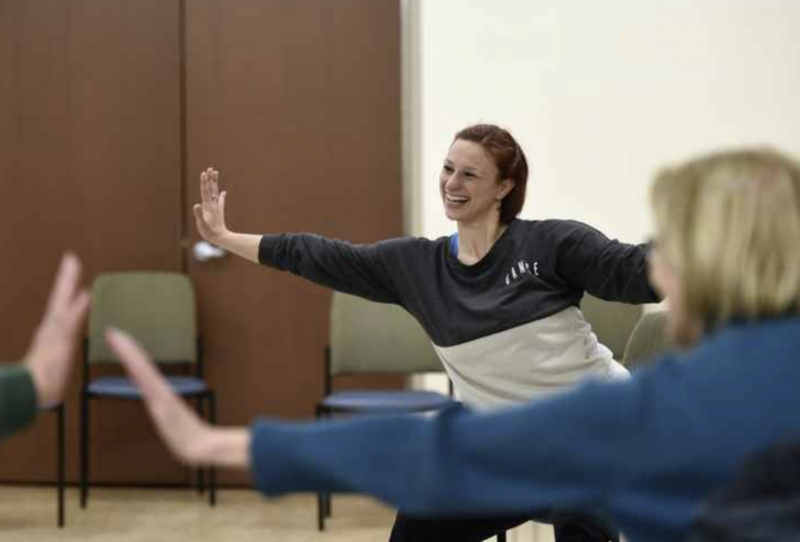 Participants will be challenged to find freedom within structure, story-tell with their movement, create connections between dance and “everyday life,” and (re)discover joy in their dancing body. Previous experience witha movement practice (yoga, Pilates, martial arts, or other form of dance) is highly suggested, but not necessary; an open heart and mind is always welcome and appreciated. More questions? Check out Jessica’s blog post. Fieldnotes – Reflections & research from a performer, choreographer, educator, advocate, creative connector, & kinesthetic anthropologist. Read more about Jessica Warchal-King and JCWK Dance Lab’s journey since 2010! Make a tax deductible contribution to furthering the performance, education, and research of JCWK Dance Lab! We are fiscally sponsored by Fractured Atlas as The Embodiment Project, LLC.